1. Preheat oven to 375 degrees. Melt butter and olive oil together in a baking dish in the oven. Once melted, mix well and add Quatro Pepe Vinegar, and shrimp. Place back in the oven for about 10 minutes, careful not to overcook. 2. Polenta needs a little extra time to cook, so start while the oven is warming. Bring liquids to a boil, add a touch of salt to liquid while heating. Once boils, turn to med/high and slowly whisk in polenta to make sure there are no lumps. Turn to low/med heat (careful it is like molten lava if it splashes on you) and continue to stir until done. Add goat cheese and parsley. 3. 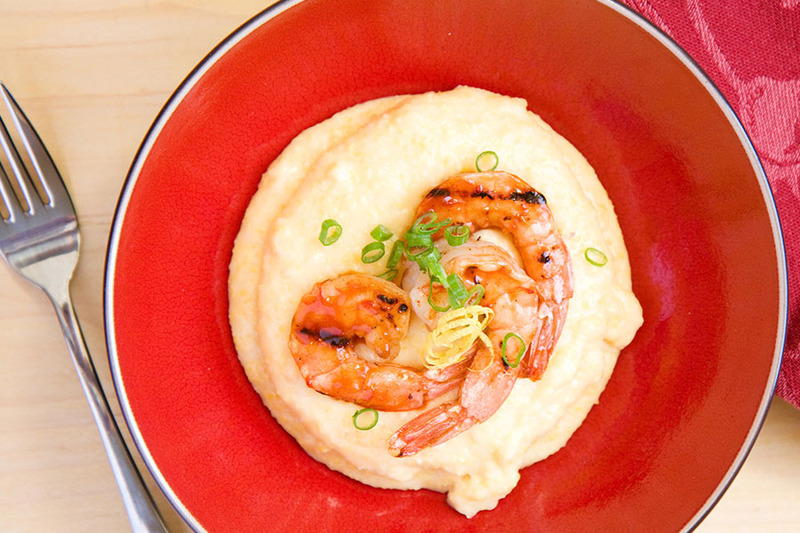 Divide a spoonful of polenta to each bowl, arrange prawns around; I like tails up, and spoon liquid over all. Can top with more parsley or grated cheese if you like. Serve with focaccia or Italian style bread to sop up the extra juice. Enjoy!